How clever and entreprenurial of Teamson Kids toy company to produce this Monster Mansion that just so happens to be perfectly scaled for Monster High Dolls. (It works for Barbie, too). 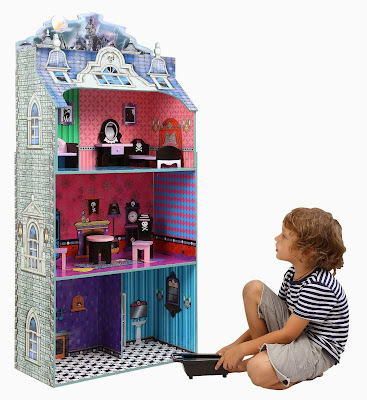 The dollhouse is made of wood, not cheap plastic, so it might feel a little nicer and less fakey and plasticky than the tacky dollhouses Mattel offers for Monster High dolls to live (or die) in. It's also sold on eBay.